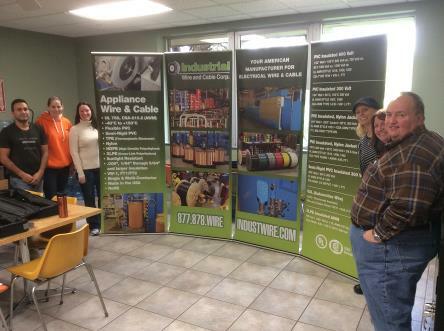 Industrial Wire & Cable Corp. has been a manufacturer of copper wire and cable products since 1962. We produce the highest quality products, to meet customer's specifications. We begin our manufacturing process from 5/16 copper rod allowing us to maintain tighter tolerances within the manufacturing process. Industrial Wire & Cable Corp. has state-of-the-art equipment, including, rod breakdown and multiwire drawing machines, double twist bunchers, cablers, extruders and high speed dual spoolers. Industrial Wire & Cable continues the tradition of offering our customers the highest quality products and services at competitive prices. We have combined both fabrication and wire insulating companies into our 100,000 square foot facility located in Lake Zurich, IL. Come check out Carl Calabrese, president of Industrial Wire & Cable Corp being interviewed at the Solar Power International Show! Please note: If you are using a web based client such as hotmail, gmail, etc, please copy and paste the above address to send an email. To copy email right click on link.